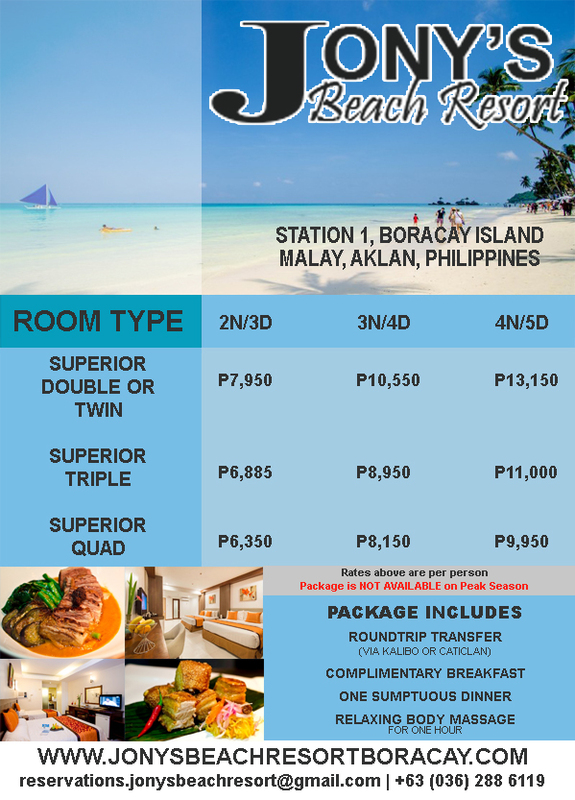 Located in one of the best beaches in the world, Jony's Beach Resort Boracay is one out of many prestigious resorts you can discover on the island. We are the oldest, steadfast, family-founded and traditional establishments in Boracay Island. We are the most favourite place to stay no matter the season for experiencing one of a kind homey and tender atmosphere with comfortable well-designed rooms with a mix of modern and tropical touches intertwined. We provide a sensational beachfront view wherein excellent adventure awaits you. Moreover, the limited rooms we have, explain the intimate setting, ensuring our guests are greatly satisfied throughout their stay. We are entitled as a home in paradise where our hospitality shines the brightest. Here with us, we guarantee you wouldn't leave the island without flawless service and fond memories. The wonderful encounters don't stop there! Our restaurant, Mayas Filipino & Mexican Cusine is the most popular dining destination and has been featured many times in travel magazines and on television internationally. Compell yourself with the island's greatest and appreciated Chef, Jun Salme, with his luring and delicious specialities you absolutely wouldn't want to miss. Complete a Boracay experience by tasting the best shakes on the island, amazingly, that we can definitely fix for you! Win your heart by sipping on our famous and original Jony's fruit shakes passionately served since 1982. End your daydream now and visit us soon! We make wishes come to life. We originally started from having cottages sometime during 1985 while humbly working our magic on our fruit shakes which happened to be the very first here on the island. We are popularly known and given diplomatic recognition by everyone to be Boracay's original and best fruit shakes up to the present. Experience a one of a kind staycation with us. With undying love and support from our loyal customers, guests & hardworking staff, we were able to grow our business and make use of our success by developing & expanding our business. We started having Jony's Beach Resort in 1996 which was later followed by Jony's Boutique Hotel in 2016. We were also able to start with our restaurant namely Maya's Filipino and Mexican Cusine in the year 2010 and The Pig Out Bistro by the year 2016.